Mikey’s Yarn Bombed Bike. He’s the Creative Director of The Crochet Crowd. I’ve been thinking a lot about yarn bombing lately. It’s because we are working on our Crochet-Arium Exhibit. I find it’s a bit addictive because it’s creativity unleashed. 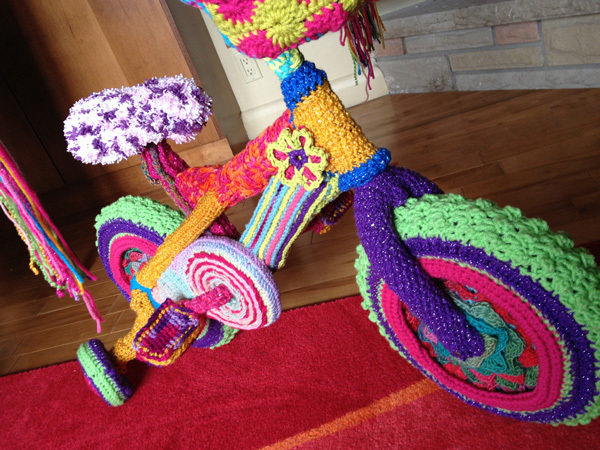 The bike above is one of my ultimate crochet masterpieces and I am extremely proud of it. I was interesting locating other examples of yarn bombing exhibits. I stumbled across this fabulous link called 30 Colorful Examples of Yarn Bombing Exhibits. I have to say I think both stairways in the exhibit are my favourite. Sure you may like the cars, bikes and objects. The gas station is way over the top but interesting too. One of the projects was done on a bridge which is near where I live. You may remember that Sue Sturdy was in charge of the Flowers for the Museum that we participated in last year. Take a look at the examples in the above link. The colour itself is inspirational! Enjoy your evening! This entry was posted in Advice & Tips and tagged Andy Warhol Bridge, Art, Craft, Crochet, Knitting, Knitting and Crochet, Yarn, yarn bomb. Bookmark the permalink. Mikey: Two “yarn bombers” you might want to check out. Olek, a polish lady, who did the bull on wall street in your post. Just search her name and it will lead you to her. The other, is Magda a business (yarn shop?) owner from Austin TX, who goes all over the world and does installations. She is “knitta” at word press. Both do lots of cool stuff and travel all over the world doing yarn installations at festivals, etc. That bike is really terrific! And the link is inspiring. I don’t know why it is so shocking and moving to suddenly see functional “outside” & “big” objects covered with crochet and knitting, but it just gives me so much joy and connects so many otherwise distant circuits in the heart, soul and mind… thanks!